PETER BRAGG, returning from lunch, accompanied by his partner, in the middle of a somewhat slack day, found Miss Ash, the perfect secretary, seated in his special chair, speaking into the telephone. Her manner, as she looked up at the entrance of her employer followed by Angus, indicated relief. A young woman of amazingly equable temperament, she was almost flustered. "Sir James Kenmar is waiting to see you, sir," she announced. "I was just trying to get you on the telephone." "Kenmar?" Peter Bragg repeated, "I wonder what he wants. Show him in, Miss Ash. Have you met him, George?" "Once or twice, but not lately. He doesn't go out nearly as often as he used to." Miss Ash opened the door of the waiting-room and spoke to its solitary occupant in a tone almost of reverence. Then she stood on one side to let him pass. He was one of the few great actors of the day whose appearance off the stage was at least as impressive as on. He had had the advantage of birth, a public school and college career, and he retained the naturalness of manner which somehow or other his understudies on the stage or in life failed to acquire. He looked hard at Peter Bragg and, recognizing Angus, nodded to him. "Hullo," he exclaimed. 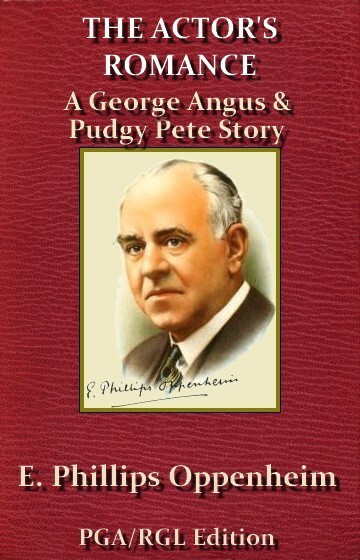 "George Angus, isn"t it? Are you a client too?" "Glad to see you. Sir James. No, I'm a partner in this show." "The devil you are! Well, let me warn both of you gentlemen at once then that I'm here to lodge a complaint." He installed himself in the chair which Peter Bragg had indicated. In the clear afternoon light the lines of approaching middle age were clearly visible on his handsome face. He was still, however, a very attractive-looking man. "A complaint," Peter Bragg observed. "I don't remember that we have had the privilege of entering your name upon our books." "If you haven't got it one way you have another," was the prompt reply. "I suppose you know all about it. For two months now, without a moment's cessation, I have been shadowed by one of your infernal men. I have come to ask what the devil it means?" "In other words," Peter Bragg remarked dryly, "you ask us to divulge the name of our client. Sir James, notwithstanding a proverbial affability, was not always good-tempered. His tone now was almost angry. "Client be damned!" he exclaimed. "I'll go before the magistrate if it's necessary, but I will be relieved of this infernal surveillance." "There is no method of escape for you except by arrangement. Sir James," Peter Bragg assured him. "A summons was applied for once before by a man who was suing for a divorce and was being watched. The application was dismissed at once." "In any case then," Sir James proceeded, after a moment's reflection, "if you will not undertake to remove your man, I do insist upon knowing who it is who is having me watched." "At the present moment," Peter Bragg confessed, "I have not the least idea myself. If you like to give me an hour or so to make inquiries at Strand House, I'll see what can be done. At present I am as ignorant of the whole affair as you are." "At what hour then will it be convenient for you to see me again?" Sir James asked, glancing at his watch. "At half-past five this afternoon or at eleven o'clock to-morrow morning." "At half-past five this afternoon I will return." Sir James departed, leaving an impression behind of dignified but justifiable anger. Peter Bragg spoke for a few minutes to his managers at Strand House on the telephone. "Rather a domestic sort of chap, Kenmar, isn't he?" he asked Angus, after he had put the receiver up. "I've always thought so. To judge by the number of photographs you see of him in the home circle he can't have time to be anything else...."
AN OFFICIAL from Strand House arrived presently with a little bundle of reports. Both partners studied them carefully. When they had come to an end, Peter Bragg leaned back in his chair. "Well," he declared, "I had no idea that the life of a popular actor could be so dull. A walk in the park from half-past ten or a round of golf, luncheon at home, half an hour's sleep and then the club. Afterwards the theatre. Then either a little supper party at which his wife always seems to have been present, or else another hour at the club, and home. The same program for five days following! And there isn't a single Sunday upon which he hasn't spent the whole day with his family. Who on earth is paying to have such a paragon watched?" "We have reason to believe, sir," the man from Strand House confided, "that the name of our client is assumed. He wished to remain anonymous, but we explained that it was impossible. We address our communications to Mr. Mackinden at a post office in Piccadilly. The money is paid always in bank notes in advance." "Write to Mr. Mackinden at the post office and ask him to call here," Peter Bragg instructed. "The whole thing seems a stupid waste of time, and he is keeping one of our best men out of more interesting work." At half-past five Sir James presented himself once more. For some reason or other his manner since the morning seemed to have changed. If such a thing had been possible one might have surmised that he was in the least degree nervous. "Well," he demanded, "have you made up your mind to do as I asked and disclose the name of your client?" "For the moment," Peter Bragg replied, "I am not able to do that, but I am anxious—we are both anxious—to meet you in every possible way. I have written to the person upon whose instructions we are acting, asking him to come and see me at once, and I am going to suggest to him that, in view of the reports we have received, this surveillance of your movements is a complete waste of time, apart from the fact that it is annoying to you. I shall ask this person, therefore, if he persists, to employ some other agency." "And how much the better off shall I be?" Sir James demanded, with a note of anger in his tone. "What I want to discover is the identity of the man or woman who is persecuting me in this manner." "That I cannot possibly tell you at the present moment," Peter Bragg said firmly. "After my interview tomorrow I may be in a different position." Sir James departed grumbling but with an appointment for the following afternoon. PUNCTUALLY at eleven o'clock the next morning, according to an appointment reluctantly conceded, Mr. Mackinden was announced. Both Peter Bragg and Angus received their visitor with some curiosity. Without a doubt he was in a way a personage. He was dressed in somewhat foreign fashion, but with scrupulous care and neatness. His manners were irreproachable. "It is very kind of you to have come," Peter Bragg found himself saying. "To tell you the truth, we have had a very angry visit from Sir James Kenmar, the actor." "As you know, we have been shadowing him for the last two months on your account. The reports, of which you have daily copies, would seem to suggest a life entirely normal and without incident. Might I ask if it is your wish that we should continue the commission?" "Naturally, until I give you instructions to the contrary," Mr. Mackinden said. "I do not understand why you should ask the question." Peter Bragg was for a moment nonplused. "But the man's a model," he pointed out. "There isn't a place he has visited or a thing he has done which could be regarded as in the least degree suspicious." Mr. Mackinden contemplated for a moment the end of his shining patent-leather shoe. "It appears to me, Mr. Bragg," he said, "that we are slightly at cross purposes in this matter. I take it that you are responsible for making the inquiries, and I for forming an opinion upon them. Your reports have afforded me information which I desired. I am absolutely pledged to their continuance. If, therefore, the object of your sending for me is to say that you wish to retire from the business, I can, of course, employ another agency." Peter Bragg considered the matter. "Perhaps on the whole," he decided, "you had better do so. We have kept a faithful record of the movements of a well-known person for some two months without discovering any reason for such surveillance. Under those circumstances, as the person in question has expressed himself annoyed, we should prefer to discontinue our efforts. We are sorry to lose a client, Mr. Mackinden, but Sir James is a person entitled to some consideration." Mr. Mackinden rose to his feet. "You are perfectly within your rights, Mr. Bragg," he acknowledged. "I shall shortly issue instructions to another firm." "That," Mr. Bragg replied, "must be as you wish. Before you leave, however, I should like to ask you this question: Sir James is most anxious to know at whose instructions he has been shadowed for the last two months. Am I at liberty to tell him?" There was a flash of anger in the visitor's cold gray eyes. "I should consider your doing so, sir," he pronounced emphatically, "a gross breach of confidence." "That ends the matter then," Peter Bragg assured him. The door closed behind Mr. Mackinden. Sir James presented himself that afternoon at the appointed hour. He was as distinguished and as good-looking as ever, but the slight fit of nervousness from which he seemed to have been suffering on his previous visit was still evident. His first question was sharply asked and there was a note of anxiety in his tone. "Well, have you found out who this Johnny is who's wasting his time and money on me?" he demanded. "I have had an interview with our client," Peter Bragg confided. "We do not know, however, whether he is acting on his own account or on someone else's and I regret to say that he point-blank refuses to allow us to disclose his identity." "You mean that you can't tell me who he is?" "I am very sorry but I'm afraid we can't. On the other hand I intimated that we could see nothing in the reports we had submitted to warrant your being exposed to annoyance, and I have, therefore, told him that from midnight tonight our engagement with him ceases." "He will only go somewhere else," Sir James muttered gloomily. "That, I am afraid, is a fact," Peter Bragg assented. Sir James looked steadily at a calendar across the room. "Mr. Bragg," he said slowly, after a moment's pause, "you don't want to lose a good client, I suppose. Let me make a proposition to you. Continue the commission on your own account. I promise you I will make no further complaint, but—grant me this one favor—let me be a free man for one day—Thursday next, the seventeenth of October." "I'm afraid I couldn't do that. Sir James," Peter Bragg pointed out. "If I accept the commission, I must accept it in its entirety." The actor rose to his feet. For a moment he remained deep in thought. "Mr. Bragg," he said, "if there is no escape from this damnable espionage it would perhaps be better if you continued to act, for the present at any rate, on behalf of my unknown enemies. The idea of a further detective agency being dragged into the matter is simply ghastly. I withdraw my protests. Earn your fees from your unmentionable client, but—"
It was evident that at the moment Sir James was almost inclined to extend a certain measure of confidence to his two companions. For no obvious reason, however, he changed his mind. He departed with a farewell glance at the calendar but without another word. Peter Bragg and his partner exchanged a quick look. "Better send word round to Mackinden that we'll continue the commission," was Peter Bragg's only comment. Angus scrawled a hasty reply, went home and changed, and at half-past eight was at the theatre. The house, as usual, was packed; the play—by a famous playwright—was an established success, and Kenmar, as the shrewd but kindly diplomat, full of small and lovable humanities, kept the house enthralled. At the end of the first act, Angus found a manservant waiting for him in the lobby and was taken round to the actor-manager's room. Kenmar, still in his make-up, with a dressing gown in place of the court dress he had been wearing, received his visitor with a cordiality which was almost pathetic. "It's awfully good of you to come, Angus," he said. "Put the whisky and soda on the table, Richards, and leave us. Come back in time to get me ready." The man, swift-footed and dexterous, produced decanter, soda water, tumblers and cigarettes, and arranged them upon a small Georgian sideboard. "See that I am not disturbed," his master directed, as he prepared to leave the room. "You had better remain somewhere about to stop anyone coming in. I saw one of those newspaper men in front tonight." "I will see that no one disturbs you, Sir James." The man departed, closing the door noiselessly behind him. Sir James crossed the room and turned the key in the lock. "That makes a certainty of it anyway," he remarked. "Help yourself, Angus. I never take anything until the show's over, but I'll smoke a cigarette." He lit one and stood upon the hearthrug looking down at his guest. "Angus," he continued, "you may think my appeal to you a little extraordinary considering the fact that we are really scarcely more than acquaintances. Still, I must have a confidant. I'm up against a very terrible crisis. You can take it that I am consulting you, if you will, as Bragg's partner, or as a friend. I must have help." "I'll do what I can," Angus promised. The slight mannerisms of the actor had fallen away. Sir James told his story as a man face to face with trouble. "I am fifty-six years old, Angus," he confided. "The papers all lie about my age, but that's the truth." I've been married twenty-four years. I don't need to say anything about my wife. She is one of these sweet, even-tempered, good-dispositioned women who were born to do the right thing, to give their lives for their children and their husbands, and who haven't a selfish impulse in their body. We got on all right—I suppose! I was no better nor any worse than most other men—rather better, I think—until one winter eight years ago in New York." Kenmar paused and changed his position restlessly. Angus, seeking to analyze some faint and unaccountable difference in the man's tone and demeanor suddenly realized that for the moment the actor existed no longer; it was the man speaking out of his body—the man, a stranger. "I was out there with my company," he went on—"successful as usual, making money as always. It was the ordinary life which had suited me very well up till then—fêted a little, flattered a little, entertained all the time. One night I was taken to a small reception. I met a woman there whose name had driven mine out of the newspapers for several days. I spare you her name; she was a Russian, a princess, and a good deal more of that sort of thing. I will call her Vadia. She became that to me that night. I have never thought of any other name. Angus, this is getting terribly difficult." The wonderful voice had actually broken. Angus nodded across at him sympathetically but remained silent. "I've never spoken of her to anyone else," Kenmar continued. "To another man it sounds—wrong. I haven't any words to make it sound right. You see, in a way I'm a queer sort of person for such a thing to have happened to—a popular actor, cramped in life and ideas from one's very environment—a little of the manhood squeezed out here, a little of the imagination from another place. You know what we are, the finished article. I didn't know then; I do now—enough to despise what we may drift into being.... Well, the next day she disappeared. She had to. With the utmost regret in the world the New York police had to tell her that they couldn't defend her. She had .stayed on in Russia with one purpose. Again I shan't weary you. She killed the man who betrayed her family before she left, and in London and Paris and over there she's done more harm to the Bolshevists than any man or woman who ever escaped from that country alive. She went into hiding; I went with her. The newspapers were full of my sudden illness. Fortunately my understudy was good. I was with her until she went to South America. I crept back to the hospital in New York, finished up my tour abruptly and came back to England." THERE was another silence. For a simple story, Angus felt the unspoken eloquence of it vibrating in the atmosphere of that queerly modern apartment—the actor's dressing-room, with its lingering odor of unguents and flowers and stale cigarette smoke, the dressing table with its mummer's outfit, the masculine trifles here and there, the faint note of unreality which not oven Kenmar's masculine enough personality had been able to dispel. "I don't know what there was in me of hidden greatness," he went on, after a moment's pause, "which brought us together with the first flash of her eyes, the first word she spoke, the first thrilling touch of her fingers. You'll have to take all that for granted, Angus. It has happened to people all through the ages, and even now no one understands. Only this I must have you know and believe—since that moment eight years ago I've lived three hundred and sixty-four days of each year waiting, and one day in the most marvelous paradise God could create. Once every year—the anniversary of that night in New York—we've met. She's come sometimes from the furthest corners of the world. We never write. She knows where I am, and she comes. The understanding is that I never ask for her whereabouts, I never follow her. Twice I have been in outlandish places on the morning of the day, but my message has always come. "And all these eight years, Angus, she has lived in peril of her life. Some day or other the end will come. Perhaps no one will ever hear of it. You'll see the change in me. Last year, on our last meeting, for the first time in her life, there was a little less fatalism, something that was almost like the shadow of fear in the way she spoke. All over the world they grow richer and stronger, her enemies. She was hounded out of China, escaping death by a miracle. They had a flash of genius at last, these men. When they lost track of her they came to Paris where I was. They were a day too late. Our wonderful twenty-four hours had passed and she was away. This year—now do you know, Angus," he demanded passionately, "why those men of yours who day after day make their harmless report of my little life are filling me with terror and horror? They know, that if she's alive, nothing will keep her from coming and me from going when the day comes, so they watch me in order to bring about her doom." His finger shot out toward the calendar upon the wall. "The sixteenth! Tonight, before, I leave the theatre I shall have my message. It was at five minutes to one that I met her in New York. At five minutes to one tomorrow morning I shall be with her for twenty-four hours—just twenty-four hours out of the whole year. My understudy will play tomorrow night. I shall be suddenly indisposed. That is, if I go." "If you go?" Angus repeated, a little dazed. Kenmar was suddenly ablaze. He stood up. Not even the sound of laughing voices outside in the corridor stojaped him. He struck the table with his fist. "Don't you see?" he cried out. "When I leave here tonight I lead those blasted sleuth hounds to her hiding place. She will pay for the rapture of our love with her life. Who do you suppose is your nameless, your infamous client? One of that bloody nation of murderers, his fingers itching for her throat, his steel for her body." "My God!" Angus muttered. There were sounds of increased movement outside, a warning knock at tlie door. "In ten minutes. Sir James," his manservant announced. Kenmar made no reply. His eyes, filled with a passionate demand, were fixed upon Angus. The sweat was standing out in little beads upon his forehead. He was like a man gripped in the sway of some terrible emotion. Upon their speechlessness came the anticlimax of a furtive knock on the door. Kenmar crossed the room and unlocked it. The manservant entered, bearing a note. "A messenger has brought this for you, Sir James," he announced. Kenmar snatched at it. He held it in front of him—a simple address in violet ink, scratchy characters, a blot in the corner. He held it in front of him until the door closed behind the servant. Angus gazed at him almost in awe. The storm had passed. The joy on his face was the joy of a child. His lips were quivering, his eyes suddenly youthful. Great actor though he was, there was an emotion here which even his art could never have reproduced as he tore open the envelope and read the few enclosed lines. Angus rose to his feet. He crossed the room and, although they had never been anything more than acquaintances, ho passed his arm affectionately round the other's shoulder. "You can go where you will tonight, Kenmar," he promised. "No one shall follow you. You can take my word for that." Kenmar gripped his hand. The gratitude in his face was more than the gratitude a man gives for a life saved. ANGUS paused outside the stage door of the theatre to light a cigarette and consider the situation. There was an entire act of the play yet to be produced and a reasonable interval to be allowed for Kenmar to change his clothes. The act, however, was the shortest in the piece, and as it had already commenced it was scarcely safe to reckon upon more than half-an-hour's grace. Unconsciously, during the next fifteen minutes, he paid unwilling tribute to the sagacity of the myrmidon from Bragg's Detective Agency of whom he was in search. There was certainly no one who had the least appearance of loitering about in the street, no one who fulfilled in the slightest degree one's idea of the modern sleuth-hound. Angus began to get worried. Supposing the fellow should make his appearance only at the last second, there would be no time to talk to him. Then he suddenly realized that a fashionably dressed young man who had just said good-bye to another at a corner of the narrow street had turned back toward the stage door. Something in his bearing was at once familiar. Angus hurried after him. "Saunders," he said, touching him on the shoulder, "I want a word with you." "I thought you did, Mr. Angus," the other replied. "That's why I sent my pal away." "Your pal? There aren't two of you on this job, are there?" Angus demanded. "Certainly not, sir. If I can pick up one, though, I always bring a dummy round for a minute or two. It looks better to be seen talking to someone than to be hanging round alone." "Well, I'm glad I've found you, anyway," Angus declared. "You can cut out tonight's work. We've decided to abandon our commission." "You mean," Saunders asked slowly, "that you don't wish me to follow Sir James tonight?" The man threw his cigarette away, but he showed no signs of moving. "You'll excuse my pointing out, Mr. Angus," he said, " that when I left the office my instructions stood. Have you seen Mr. Bragg or Mr. Hopkins during the last half hour?" "I have not," Angus replied, "but you know quite well what my connection with Mr. Bragg is. I am in a position to give orders if necessary, and I do give them to you now. In view of circumstances which have come to my knowledge during the last hour I have decided to take you off this case." Saunders reflected for a moment. "You're putting me in a very awkward position, sir," he complained. "You will be in a far more awkward one if you don't obey my instructions," Angus assured him. The man glanced toward the front entrance of the theatre. A thin stream of people were already coming out; the whistles were beginning to sound. "I 'm sorry, sir," he decided. "I've had special instructions about this evening. I've been told to be more than ordinarily careful. Our client has promised me a double fee for my report tonight." "There won't be a report," Angus insisted. The man had made up his mind. "I beg your pardon, sir, but there will," he answered. Angus glanced up at the stage door. Under the light a tall, familiar figure was standing, pausing for a moment to say good-night to the doorkeeper. He laid his hand upon his companion's arm. "Look here, Saunders," he promised, "I'll see you through this if you do as I say. I'll guarantee you your place and a hundred quid if you'll come round with me to the Savoy and have a bit of supper." "Nothing doing, sir," the man replied, turning away with a stealthy glance toward the passage leading from the stage door. "Then look out for yourself," Angus warned him, with a little groan. Saunders turned around to meet Angus' fist in his face. Exactly as the latter had calculated, with the first sting of pain, he saw red and forgot everything else for the next few moments. There was a scream of delight from the newspaper boys and loiterers of that ilk. "Two toffs fighting outside the Imperial Theatre!" There was an irregular ring in a few seconds—and the two men fought. PETER BRAGG, in the midst of an annoying and disturbing morning, looked up at his partner's entrance with a little gasp of dismay. Angus had a black shade over one eye, a piece of cotton wool strapped on to his cheek, a swollen lip and his arm in a sling. "What the devil have you been doing with yourself?" he exclaimed. Angus sank into a chair. "You should see Saunders," he murmured, with a reflective smile. "Where have you spent the night?" Peter Bragg demanded. "I sent up to your rooms and over to Moningham House." "In a police cell," was the cheerful reply. "So did Saunders. Only way to keep him with me, you see. I say. Pudgy, be a good chap and give me a whisky and soda. As a matter of fact, I haven't been to bed at all. I came straight here from the police court. A chemist patched this up last night, but I've got a nurse coming in ten minutes with a doctor pal to fix me up properly." PETER BRAGG rose to his feet, unlocked his cupboard and mixed a generous whisky and soda. He prepared for himself a sherry and bitters. "I think it only right to let you know, George," he said stiffly, after a mechanical exchange of greetings, "that you have placed the reputation of my business in considerable jeopardy. Mr. Sodor Mackinden has been here twice already, besides ringing me up at my rooms last night. He is threatening to bring an action. And so far as I can see he will be perfectly justified if he does." Angus drank half his whisky and soda and handled the tumbler containing the remainder lovingly. "Mr. Sodor Mackinden, as he calls himself, is the representative of one of the rottenest branches of the Bolshevist Secret Service, and what he's out for is nothing more nor less than murder," Angus confided. "It ain't our job. Pudgy, to work for such scum. Still, I admit, on the face of it, you've got a grievance. Here's the story." Angus told it, pithily and without undue verbiage. Peter Bragg listened to the end in silence. He was indubitably impressed. "But, George," he protested, "surely it was a bit rough on Saunders—a man who was only doing his duty in our employ—to start a brawl with him in the open street, to say nothing about the damage to your own reputation. What happened?" "I got five pounds or a month," he confessed. "Saunders would have had the same, but I took the blame for the whole affair—said I lost my temper." "Five pounds or a month!" Peter Bragg repeated in a shocked tone "Why, what on earth will your father say?" Angus finished drinking his whisky and soda. "I've got it on the governor all right," he replied. "He went to prison for three days without option on a boat race night thirty-five years ago. He's got the clipping still—seems rather proud of it. Saunders is the only fellow I'm sorry for. He's terrified to face his wife. You'll have to give him a certificate that it was all in the course of business, and I'm going to choose him a gold cigarette case this afternoon. It's all right, Pudgy, eh? You're not going to chuck me out?" Peter Bragg shook his head. "Under the circumstances," he said, "accepting Kenmar's story as the truth—"
"Upon which I'll stake my soul," Angus murmured. "I should have done precisely the same as you—provided I had the physique, and provided I couldn't have made Saunders see reason," Peter Bragg concluded. "Go up and have your wounds dressed. I'm expecting another visit from Mr. Sodor Mackinden and you'd better not be in evidence." will taken by Mr. Philip Groves. Angus turned away with a somewhat wistful smile. A little thrill of romance stole pleasantly through his being. He felt his feet raised from the pavement. He was no longer conscious of any pain from that scar on his cheek. Somewhere under that gray sky which leaned down upon him murkily, a great passion was burning.